Tabula Rasa: Books or movies? Andy Dufresne is wrongly accused of murder, and is sentenced to imprisonment at the Shawshank prison. There he meets the narrator, Red, an inmate who is known for smuggling contraband into the prison. Andy gets Red to deliver him a rock hammer and a large pin-up poster of Rita Hayworth. Then he goes on to do something that has never been done before: escape Shawshank! This is a novella by Stephen King that was published in 1982 as a part of his collection called Different Seasons. If there's any author who knows how to create wonderfully complex characters and build up their lives, it's Stephen King. And this book is definitely King at his best. 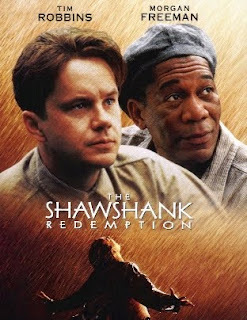 The 1994 movie Shawshank Redemption, starring Tim Robbins and Morgan Freeman received multiple award nominations including seven Academy Awards! Clarice Starling, an FBI trainee, is assigned to the case of a certain serial killer known to all as 'Buffalo Bill'. She has to interview the infamous serial killer, Hannibal the Cannibal, as he is the only one who might be able to help them solve the case. Dr. Hannibal Lecter, once a brilliant psychiatrist, is now kept in a secluded chamber in high security in a mental institution. As the story unfolds, it is he who leads Clarice to the solution and helps her uncover the truth. Silence of the Lambs is a book written by Thomas Harris, published in 1998 as a part of his Hannibal trilogy. This book has won the Bram Stoker Award for thriller fiction. The novel is one of the best in its genre. The 1991 movie based on the book, starring Jodie Foster and Anthony Hopkins has won the five most prestigious Academy Awards. Do make sure to read these books too, by the way, since I cannot imagine anyone who hasn't seen the movies! Love those movies. did not read the books though. will try to catch up. definitely books are better than movies. I know, I loved the movies too!! I even saw the Silence of the Lambs movie before I read the book...but both the books are just genius!! True in most cases, except (and I can already hear scores of fans preparing to kill me for saying this) Lord of the Rings, where the movies were infinitely better than the book. I haven't read LOTR, but the Hobbit was one of the slowest books I have ever read (at least of all the ones that pretended to be exciting!). You know i've met so many people who didn't know that the movie they are talking about is based on a book... :D like there are people who don't even know that Harry Potter is a book! But i think that almost 90% of the time, the books are better than the movies made on them! Thanks! Yeah, that's what I think too! But I like watching movies so I am looking for more exceptions!! Ya, you can say it's a tie for now! I have made a point to read the book and watch the movie.In all cases books are better than movie. About Shawshank Redemption , i saw it for the 6th time few days ago and wrote a post on the same. Do read LOTR , i postponed the movies and managed to find time for the bulky book, but was an awesome read. here is a review of the same. Shawshank Redemption is classic - both book and movie!!! Thanks for dropping by my blog.. As for books or movies.. I am more for books.. But I love movies as well.. I loved Sparks The last song.. If u like his books u will like it.. Will be posting the review sometimes soon next week or so..